Vorobyev, P., Mikhailovskaya, T., Yugay, O., Serebryanskaya, A., Chukhno, N., Imangazy, A. (2018). Catalytic Oxidation of 4-Methylpyridine on Modified Vanadium Oxide Catalysts. Iranian Journal of Chemistry and Chemical Engineering (IJCCE), 37(3), 81-89. Pavel Vorobyev; Tatyana Mikhailovskaya; Olga Yugay; Anna Serebryanskaya; Nikolay Chukhno; Aldan Imangazy. "Catalytic Oxidation of 4-Methylpyridine on Modified Vanadium Oxide Catalysts". Iranian Journal of Chemistry and Chemical Engineering (IJCCE), 37, 3, 2018, 81-89. Vorobyev, P., Mikhailovskaya, T., Yugay, O., Serebryanskaya, A., Chukhno, N., Imangazy, A. (2018). 'Catalytic Oxidation of 4-Methylpyridine on Modified Vanadium Oxide Catalysts', Iranian Journal of Chemistry and Chemical Engineering (IJCCE), 37(3), pp. 81-89. Vorobyev, P., Mikhailovskaya, T., Yugay, O., Serebryanskaya, A., Chukhno, N., Imangazy, A. Catalytic Oxidation of 4-Methylpyridine on Modified Vanadium Oxide Catalysts. 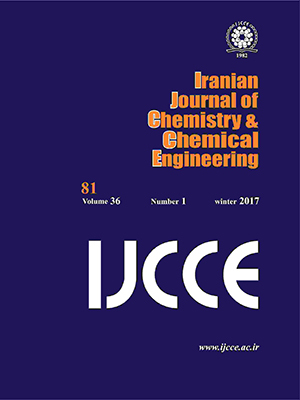 Iranian Journal of Chemistry and Chemical Engineering (IJCCE), 2018; 37(3): 81-89. The reaction of gas-phase oxidation of 4-methylpyridine on individual V2O5, binary and ternary vanadium-oxide catalysts was studied. These catalysts were modified by additives of SnO2 and TiO2. It was found that modifying V2O5 leads to increase the activity of binary contacts. Upon transition from binary V2O5-SnO2 and V2O5-TiO2 catalysts to the ternary system of V2O5-TiO2-SnO2, a higher increase in activity is observed. This extension of activity leads to increase conversion of initial substance and shifting the maximum yield of intermediate pyridine-4-carbaldehyde and isonicotinic acid to the low-temperature area. To research the mechanism of promotion, we used the quantum chemical method of Density Functional Theory. It was found that the promoting effect of SnO2 and TiO2 was caused by increasing a proton affinity of vanadyl oxygen (PAV=O). Upon transition from binary clusters to the ternary system of V2O5-TiO2-SnO2 the synergism effect is observed. It is shown that by transfer of a proton to vanadyl oxygen and formation of a new O−H bond the energy is emitted. This energy compensates a heterolytic C−H bond cleavage. It was found that the promoting effect of SnO2 and TiO2 causes the decrease of deprotonation enthalpy of the methyl substituent of the chemisorbed substrate. The results of the calculations agree with the experimental data on the influence of oxide modifiers on activity and selectivity of the studied catalysts in 4-methylpyridine oxidation. Yugay O., Mikhailovskaya T., Sembaev D., Vorobyev Р., Oxidation of 3- and 4-methylpyridines on Vanadia-Anatase and Vanadia-Rutile Catalysts, Eur. Chem. Tech. J., 4: 337–342 (2012). Shishido T, Preparation of Crystalline CrVO4 Catalyst by Soft Chemistry Technique and Application for Vapor-Phase Oxidation of Picolines, J. Jap. Petrol. Inst., 54(4): 225–236 (2011). Bhattacharyya S.K., Kar A.K. Vapour Phase Oxidation of 4-Picoline to Isonicotinic Acid in Fluidized Bed, Indian J. Appl. Chem., 30: 42−47 (1967). Bhattacharyya S.K., Shankar V., Kar A.K., Catalytic Vapor Phase Oxidation of monomethylpyridines to pyridinecarboxylic Acids, Ind. Eng. Chem. Prod. Res. Dev., 5(1): 65−72 (1966). Martin A., Lücke B., Niclas H.-J., Förster A. Vapor-Phase Oxidation of 4-picoline to Pyridine-4-Carboxaldehyde on Vanadium Phosphate Catalyst, React. Kinet. Catal. Lett., 43(2): 583-588 (1991). Kulkarni S.J., Ramachandra R.R., Subrahmayam M., Farsinavis S., Kanta R.P., Rama R.A.V., Oxidation and Ammoxidation of 4-picoline over Vanadium-Silico-Aluminophosphate Catalysts, Ind. J. Chem. Sect. A, 35: 740−745 (1996). Yang Gao-Jun, Huang Hai-Feng, Lu Han-Feng, Liu Hua-Yan, Chen Yin-Fei, Oxidation of 4-picoline to Isonicotinic Acid on V-Ti-O Catalysts, J. Chem. Eng. Chinese U., 3:448–453 (2007). Hoеlderich W., Verfahren Zur Herstellung von Isonikotinsaeure, DE Patent 10146088 (2003). Koсh W., Holthausen M.C., “Chemist’s Guide to Density Functional Theory”, 2nd Ed., Wiley-VCH, Weinheim (2001). Becke A.D., Density-Functional Thermochemistry. III. The Role of Exact Exchange, J. Chem. Phys., 98: 5648 (1993). Lee C., Yang W., Parr R.G., Development of the Colle–Salvetti Correlation-Energy Formula Into a Functional of the Electron Density, Phys. Rev. B, 37: 785 (1988). Ganduglia-Pirovano M.V., Hofmann A., Sauer J., Oxygen Vacancies in Transition Metal and Rare Earth Oxides: Current State of Understanding and Remaining Challenge, Surface Science Reports, 62: 219–270 (2007). Sachtler W.M.H., Dorgelo G.J.H., Fahrenfort J., Voorhoeve R.J., Correlations between Catalytic and Thermodynamic Parameters of Transition Metal Oxides, Rec. Trav. Chim, 89: 460−480 (1970). Yoshida S., Murakami T., Tarama K. 51:195 Structural Study on Promoting Actions of Titanium Dioxide and Stannic Oxide on Vanadium Pentoxide Catalysts, Bull. Inst. Chem. Res., Kyoto Univ , 51(4): 195-205 (1973). Cram D.J., “Fundamentals of Carbanion Chemistry”, Academic Press, New York–London (1965). Witko M., Tokarz R., Haber J., Quantum Chemical Calculations of Molecular Properties of V2O5 Clusters, J. Mol. Catal., 66(2): 205−214 (1991). Witko M., Tokarz R., Haber J., The Role of Atom Which Terminate Clusters: Quantum Chemical Study, J. Mol. Catal., 66(3): 357−366 (1991).